As the Guardian’s Julian Borger recently reported (Iran nuclear talks: Settling for confusion in Baghdad, hoping for clarity in Moscow, May 29th) Iran and six of the world’s major powers agreed to settle on confusion at the latest round of negotiations in Baghdad and which adjourned on May 24th with no sign of progress. The focal point of the talks was the international community’s call on Tehran to stop enriching uranium to 20 percent purity, which is a short technical step away from highly enriched uranium that can be weaponized. The Iranians have responded with calls of their own for an immediate easing of the increasingly painful economic sanctions which have been imposed on them. United Nations Security Council Resolution 1696 – passed on July 31, 2006. It demanded that Iran suspend all enrichment-related and reprocessing activities, invoking Chapter VII of the UN Charter, but did not impose sanctions. United Nations Security Council Resolution 1737 – passed on December 23, 2006. It banned the supply of nuclear-related materials and technology and froze the assets of key individuals and companies related to the program. United Nations Security Council Resolution 1747 – passed on March 24, 2007. It imposed an arms embargo and expanded the freeze on Iranian assets. United Nations Security Council Resolution 1803 – passed on March 3, 2008. It extended the asset freezes and called upon states to monitor the activities of Iranian banks, inspect Iranian ships and aircraft, and to monitor the movement of individuals involved with the program through their territory. United Nations Security Council Resolution 1835 – passed on September 27, 2008. It’s a wonder of modern day statecraft that such bold resolutions haven’t managed to persuade Mahmoud Ahmadinejad and his Mullah regime to give up their pursuit and development of the bomb. And the short list above doesn’t include the bilateral sanctions leveled by the European Union, United States and other countries against Iran. Date of quote: February 9, 2010. Albert Einstein once said that insanity can be defined as “doing the same thing over and over again and expecting different results.” As such, is Yukiya Amano, the Director General of the International Atomic Energy Agency, just slightly mentally deficient? Perish the thought. Rather, the meat and marrow of any deal is, unfortunately, secondary to the political spinning at play whenever a perceived breakthrough on inspections is proclaimed. If the true goal of these talks is to resolve the polarizing issue of Iran’s nuclear program in one of the world’s most volatile regions – and not to simply claim faint diplomatic victories that usually revolve around the tortured cliché of “agreeing to keep talking” – Iran’s race to convert enriched uranium to bomb-grade fuel can be significantly slowed in a number of ways. While the country is already nuclear capable, a nuclear-armed Iran is not inevitable. In general a concerted, synchronized implementation of the following policies could help prevent Iran from crossing the line from weapons capability to weapons production: Containment, Deterrence, Intrusive Inspections and Engagement (since the main purpose of the first three courses of action is to persuade Iran to negotiate). Should these diplomatic overtures fail there’s the option of using military force to halt or reverse nuclear proliferation. Since Israel has more to fear from a nuclear Iran than the United States, it may need to resort to force to curtail Iran’s capabilities if diplomacy fails. The Israeli Air force possesses the capability to destroy even well-hardened targets in Iran with some degree of confidence. Possible attack routes include flying over the Mediterranean, refueling from airborne tankers and then continuing east over Turkey to Iran, or having IAF planes fly southeast, over Jordan and Saudi Arabia, and then continuing northeast across Iraq. A third option would involve Israeli forces flying southeast and then east along the Saudi-Iraqi border to the Persian Gulf and then north, refueling along the way. 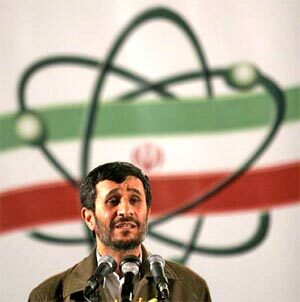 To resolve this crisis diplomatically, Tehran will need to be convinced of Western resolve to halt its nuclear program. Such a breakthrough will only occur as a result of tougher sanctions and stiffer demands than those presented in the two rounds of talks conducted Baghdad. While a diplomatic, peaceful resolution is ideal, it may not be achievable in light of the Iranian people’s — reformers and conservatives alike — strong support for enrichment. National pride in the technical prowess embodied in Iran’s nuclear program is at the core of this support. For now, the dance continues. The third attempt in three months to answer international worries that Iran’s atomic energy program may be a cover for secret weapons work is scheduled to take place next month in Moscow. How appropriate that the next round of graceful, flowing, ethereal diplomatic doublespeak that aims to bring us “peace in our time” will be held at the home of the Bolshoi Ballet. 6 Secrets of Media Objectivity: What are the principles of fair news coverage? How about this one Gideon? Resolution 487, passed on 19 June 1981, demands that Israel open its secret nuclear facilities to inspection by the International Atomic Energy Authority (IAEA). [The Security Council] Calls upon Israel urgently to place its nuclear facilities under IAEA safeguards”. By refusing to open its nuclear facilities to IAEA inspection, Israel is violating this resolution. A little less hypocrisy, eh? Hypocrisy is the state of pretending to have virtues, moral or religious beliefs, principles, etc., that one does not actually have. As such, the charge of hypocrisy would only be valid if I, as you seem to be, was claiming a moral equivalence between the police state that was once a proud Persia and a free, democratic Israel whose government is beholden to its citizenry. Furthermore, regarding proliferation, Israel has never signed the Non Proliferation Treaty and maintains an official policy of ambiguity on the issue. Finally, while you seem fixated on drawing parallels between Israel and Iran, please keep in mind that should the Islamic Republic be allowed to develop a nuclear weaponization capability, it could well be that large, oil-rich, Sunni nations in the regions will jump start their own nuclear development programs in response. In other words, today’s “Israeli” problems, be they terrorism, suicide bombers or nuclear armament, are bound to become tomorrow’s “international” crises. Thank you for reading and replying to my piece! OK. Israel has an official policy of ambiguity. Why not any other country? It could be Iran is following your example – you should be flattered! Before you cry “crazy muslims will start WWIII” or some such statement, bear in mind that like any other nuclear armed state it is unlikely they would try anything knowing that it would assure their complete descruction from some of Israel’s 300 ‘ambiguous’ nuclear weapons. Consider also that it doesn’t take a Mad Mullah to launch a nuclear weapon as 1945 will attest. If Iran had a nuclear weapon or two maybe it would calm Israel’s belligerent attitude. Not a bad quid pro quo in my opinion. Try to think these things through! You seem to be relying on the doctrine of Mutual Assured Destruction (MAD) that assumes that each side has enough nuclear weaponry to destroy the other side; and that either side, if attacked for any reason by the other, would retaliate without fail with equal or greater force. While this theory held sway throughout the Cold War, it’s doesn’t sufficiently address the threats presented by non-state players whose expansionist goals are clear and the means to achieve these goals include procuring something akin to a “dirty bomb” or worse. Allowing rogue nations such as Iran, North Korea and Pakistan to become nuclear powers presents a threat since the intimate relationship between these conflict driven governments and terrorist organizations, such as Al Queada, is well documented.In other words, Tehran may never give official sanction to launch a nuclear strike on Europe but it may supply a radical fundamentalist cell with the training, know how and even technology to do the dirty deed. Thank you! You’ve just destroyed your own case. North Korea and Pakistan ARE nuclear states. Pakistan is scarier than Iran any day. MAD works. By the way. Thanks for addressing my points and not my person. I respect that. Much appreciated. Oh my goodness! The above comment received 3 one-star ratings!! That says a LOT!! Free democratic Israel?? Try asking Uri Blau! I’d take a little hypocrisy over a nuclear armed Iran any day, Alex. See my response to Gideon’s comment. Your response as usual a total bulldust. Maybe you should show only one country where illegally acquiring and illegally keeping secret security related documents is not a crime. To call upon is completely different from to demand. Do some semantics before calling something hypocrisy which you just do not understand, maybe crippled by the very concept of hypocrisy. “call upon is completely different from demand” – you think? Well, for people trained in international politics it is evident. Not for you, obviously. The West’s “infatuation” with buying time? A very arrogant article rounded off with an unnecessary Chamberlain reference. Where is the arrogant, let alone very arrogant, attitude displayed in the article? As for the “peace in our time” quote, more than neccessary. It appears that there are some who have forgotten, or are ignorant of, the fact that within twelve months of that remark war was declared. Millions of people paid with their lives for the wilful blindness of those who thought you could appease and, or, accept the ‘peaceful’ intentions of dictators. I would hate to see that same mistake made again with the dictators who run the Tehran regime. I definitely do not want to see the people, of this and other countries, have to pay the ultimate sacrifice again because of the actions or rather the lack of action by those we elect to protect us. Alex I know from previous experience on other threads that you don’t read, or understand, the links you post. Clearly you do not read your own posts/replies either. What is the relevance of your ‘reply’ to my comment above it? Sigh! Because of it’s big stick Israel feels it can treat neighbouring sovereign states like it treated gaza. Immolation of it’s neighbours without any consequences. Alex again your reply has no relevance whatsoever to my comment above. All you do again is to spew out the same cheap, nasty, repetitive and false jibes about Israel. Very boring. Of course. Any criticism of Israeli domestic and/or foreign policy is, by definition, false. Alex criticism of foreign or domestic policy is one thing. But repeating the same old worn out slogans in the same manner as a deranged parrot, and like a parrot just making noise without understanding the words being uttered, as you do is tedious. Immolation of it’s neighbours without any consequences. What a presposterous accusation to make. So how would you describe the sacrifice of 107 women and 318 CHILDREN? Using heavy weapons in civilian areas. Where have we seen this recently? Oh yes, I remember – SYRIA. The term “immolation” suggests either nuking or the Dresden treatment. Israel is, of course, guilty of neither. Any why use yet another charged word like “sacrifice”? If you had read my comments in their context (i.e. as an answer to Gerald) you would see it is an answer to his use of the same word. I felt the same way as you, hence my answer. I don’t always get it right (some would say never) but I try not to use words that are not justifiable by argument. My choice to match term-for-term was to highlight precisely the inappositeness of the word. Alex really now you want to add mendacity to stupidity. I did not use the word “immolation” you did. However I did use the term “ultimate sacrifice” in the sentence where I make it clear that I do not want others to pay the “ultimate sacrifice” again by not taking action against dictators in Tehran as many millions had been made to pay the “ultimate sacrifice” in WW II by the failure to take action against the Nazi regime. I refer you to Godwin’s law. Alex speaking of playground bullies. Don’t need the tehran times. The same opinion was on newsnight. So what? So if it emanates from Tehran and threatens the continued existence of Israel, it is an opinion not a threat. Alex sadly your reply displays clearly your woeful lack of logic and coherence. There are several threats to the existence of Israel. Sadly none of them come from beyond it’s borders. Netanyahu and Lieberman are doing just fine without any help from abroad. Alex why are you sad that, in your opinion, there is no threat to Israel from beyond its borders? Sigh! The tactic of intentional misunderstanding here, so I’ll say it nice and simply for you. It is sad that Israel is doing it’s enemies job for them, by it’s idiotic policies. Alex I refer you to my reply of June 1, 2012 at 3:58 am. And I to mine – 8.16 Same date. Democratic regimes must provide a satisfactory degree of peace and prosperity or risk being voted out of office. Hence, progressive governments will always be reluctant to use military force as they are accountable to their citizens. Authoritarian regimes tend to be conflict based in order to consolidate power at the behest of their citizens. Historically, conflict based regimes tend to establish facts (policy) which more progressive regimes need to react to. In Iran’s case, Teheran has spent the past 2 decades establishing a proxy Shia state in Southern Lebanon via Hezbollah. Teheran has become Basher Assad’s key benefactor and lifeline. Since Saddam Hussein’s capture, Teheran has spent the last decade militarizing and consolidating Iraq’s Shia plurality whose leadership is currently in lock step with Teheran. Moreover, Iran has been pursuing nuclear arms since the Revolution. Is Israel guilty of violating UN resolution 487? Absolutely. Is Iran seeking to compliment and accelerate its documented expansionist, conflict based policy by acquiring nuclear weapons? Absolutely. Is the UN or the west equipped to preempt Iran? Absolutely not. If I were a betting man, my money would be on Israeli preemptive action to be publicly and roundly condemned by many western regimes who will quietly breath a sigh of relief when a rising Shia nations march towards regional super power is temporarily halted. Moreover, the west will force Israel to limit its reaction to Iran’s second strike (Hezbollah Missile Blitz from Lebanon and Hamas Missile Blitz from Gaza)…I hope to be wrong. The diplomatic ballet or chessgame between Iran and the West is definitely in Iran’s favour. Sagen all faule (feige) Leute. Alas, Israel can’t afford this luxury. sorry about the typing mistakes! Some German political scientists asessing the situation of the USA being in Iraque said that there will be no US attack on Iran as long as US troops are in Iraque due to Iranian threats. Now the situation is diffferent. An Israeli air attack by airplanes looks unlikely as neither Jordan nor Saudi-Arabia will give their even unofficial permisssion to a fly over due to the inner unstable situations which would erupt in this case.